Group Bombino is the latest salvo from the Agadez music scene. Led by the guitar virtuoso Omara Mochtar (Bombino), the group’s debut CD-- Volume two in the Guitars from Agadez series, represents the latest chapter in the modern sound of the Tuareg revolution. As of 2008, the Tuareg rebellion is in full force again, and Bombino is in exile to parts unknown. Agadez has been cut off from the rest of Niger. The only road that connects this legendary city with the rest of the country is littered with land mines and the only escorts are the military. This music and its messages of hope, justice, and desire for validation of the Kel Tamachek way of life ring louder than ever. Group Bombino are gaining mythic status in and around the Tuareg community for their incendiary live performances. Coming from the same scene as Group Inerane and sharing some of the same musicians, Group Bombino showcase both sides of the Tuareg Guitar style. The first half features the “Dry Guitar” sound, an unplugged selection of songs sung among the dunes and stars of the Tenere desert. The second half showcases the electric fury of the full band, a melding of heavy, psychedelic guitar heroics with a raw garage sound, back beat percussion, all swirling in extended trance rock moves. 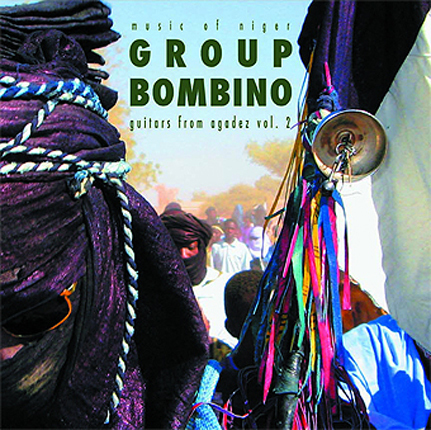 Recorded live and unfiltered in Agadez and the surrounding desert in early 2007, with the band’s equipment powered by generators and an unflinching dedication to the rebellion, Group Bombino’s music transcends any influence and ignites the raw passion of its message to the outside world. One-time LP pressing of 1,500 copies. Pressed on 180 gram vinyl and comes in a gatefold full color jacket stocked with great photos of the musicians and liner notes by Hisham Mayet.